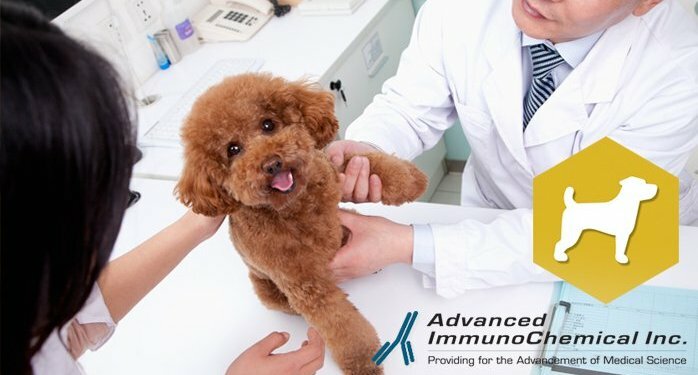 Canine thyroid stimulating hormone (TSH, thyrotropin): biomarker to reliably evaluate thyroid function - Advanced ImmunoChemical Inc.Advanced ImmunoChemical Inc.
Hypothyroidsim is one of the most frequent canine endocrine disorders. The diagnosis of hypothyroidism is based on the presence of clinical signs, thyroid function test results and response to the thyroid hormone replacement therapy. A low circulating total T4 concentration suggests hypothyroidism. However, in order to reliably evaluate canine thyroid function, the results of the T4 measurement should be combined with a TSH measurement. Open full Canine TSH, Thyrotroponin article. We provide three monoclonal antibodies that enable the development of sensitive and specific canine TSH immunoassays. These MAbs recognize native canine TSH in serum samples. Pair recommendations are shown in the Canine TSH article above. Furthermore, we provide a recombinant canine TSH. This protein has been produced in a mammalian cell line and it does not contain any tags. It can be used as a calibrator in canine TSH immunoassays. Please note: Several MAbs are available under one catalog number. Only a subset of them are specific to canine TSH. 1. Mooney CT. Canine hypothyroidism: a review of aetiology and diagnosis. N Z Vet J. 2011 May;59(3):105-14. 2. Yang X, McGraw RA, Ferguson DC. cDNA cloning of canine common alpha gene and its co-expression with canine thyrotropin beta gene in baculovirus expression system. Domest Anim Endocrinol. 2000 May;18(4):379-93. 3. Yang X, et al. Canine thyrotropin beta-subunit gene: cloning and expression in Escherichia coli, generation of monoclonal antibodies, and transient expression in the Chinese hamster ovary cells. Domest Anim Endocrinol.